Features: False dawn for Pacific nations? South Africa have confirmed that they will play host to a quadrangular tournament next year featuring Scotland, Samoa and Italy. The ground-breaking competition, that forms part of the International Rugby Board's tours schedule, will serve as the Springboks' warm-up for their 2013 Rugby Championship campaign. The tournament, that will incorporate three double headers, will kick off at the Mbombela Stadium in Nelspruit on June 8 with the second round of games taking place at Kings Park a week later. The top two sides in the table after the opening two rounds of action will meet in the final at Loftus Versfeld on June 22 with the other two teams set to face off earlier the same day. The South African Rugby Union has also confirmed the venues for the Springboks' Rugby Championship fixtures for the next three years and also where they will play their two Tests with Wales and another against Scotland in 2014. The announcement included details of an overhaul of the way that Test matches are run in South Africa. "SARU was the only major union in world rugby that didn't properly own its own Test matches," explained CEO Jurie Roux. "The decision by the Executive Committee now gives ownership to SARU. "The key benefits will be in allowing us to plough a share of the profits back into all the provincial unions and, that by controlling the ticket office and all commercial activity in the stadium, we will be able to provide an experience for our stakeholders on a par with what we experience when playing overseas. 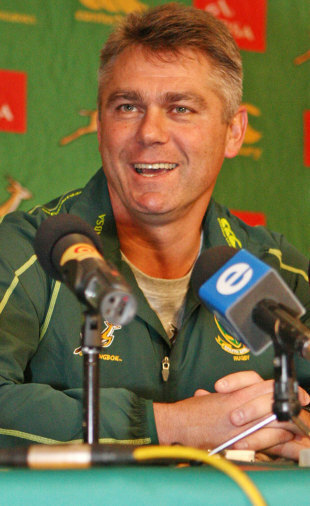 "This is a major change in how rugby is run and will present challenges," said Roux. "But the major effect is that it has placed Springbok Tests in the ownership of the mother body, for the benefit of all rugby's stakeholders. "We are taking the Springboks to a new venue in 2013 and have an exciting new competition format for the June Tests - by coincidence against two of our Rugby World Cup opponents of 2015. We have also been able to map out a home fixture schedule for the next three years - something the provinces had also wanted."